Our critic this week, Peter, is not a critic of Christianity. Rather, he has criticized my previous article in which I show the difference between vicious (arbitrary) circular reasoning and virtuous (rationally necessary, or “spiral”) circular reasoning. Peter has an unargued philosophical bias that all circular reasoning is wrong / fallacious, and that the presuppositional method used by Bahnsen and Van Til does not employ circular reasoning. Notice that no matter how much evidence I present to the contrary, he is unable to alter his presuppositions, but is able to invoke a rescuing device. Peter’s comments are in black text, with my comments in blue. Peter: No. The author here is repeating a common misconception about presuppositionalism. Dr. Lisle: Hi Peter. Greg Bahnsen and Cornelius Van Til both affirmed the necessity of virtuous circular reasoning. Bahnsen states, “We hold it to be true that circular reasoning is the only reasoning that is possible to finite man.” Do you believe they misunderstand the presuppositional method? Peter: Circular reasoning is always wrong because it is not saying anything. Peter: It just in some way repeats a statement from the premise as the conclusion. Dr. Lisle: That would be the case for a vicious circle, but a virtuous circle goes beyond “just” repeating a statement from the premise in the conclusion. Rather, a virtuous circle shows that the premise and conclusion are rationally necessary. Are you familiar with transcendental arguments? They are inherently circular, and yet are virtuous. Peter: So, a statement may be true, but the logical argument may be badly formed. Dr. Lisle: A virtuous circular argument is neither arbitrary nor inconsistent. It is valid and has true premises. So how can it possibly be “badly formed” if it violates no principles of logic? “And this brings up the point of circular reasoning. The charge is constantly made that if matters stand thus with Christianity, it has written its own death warrant as far as intelligent men are concerned. Who wishes to make such a simple blunder in elementary logic, as to say that we believe something to be true because it is in the Bible? Our answer to this is briefly that we prefer to reason in a circle to not reasoning at all. We hold it to be true that circular reasoning is the only reasoning that is possible to finite man.” (Bahnsen, “Van Til’s Apologetic” p. 518). Peter: In other words, presuppositionalism is not circular reasoning. “The method of implication as outlined above is circular reasoning. Or we may call it spiral reasoning. We must go round and round a thing to see more of its dimensions and to know more about it, in general, unless we are larger than that which we are investigating. Unless we are larger than God we cannot reason about him any other way, than by a transcendental or circular argument.” (Bahnsen, “Van Til’s Apologetic” p. 518). Do you believe that Bahnsen was mistaken about the presuppositional method? Peter: So, the author falsely charged Christianity as being circular reasoning—a fallacy (a lie)—but says this fallacy is virtuous. Dr. Lisle: The ironic thing is that you are reasoning in a vicious circle. Namely, you have assumed that circular reasoning is always a fallacy as your basis for claiming that circular reasoning is always a fallacy. Otherwise, your claim here makes no sense. How do you know that the Christian worldview is not based on a virtuous circle that is not fallacious? If the Christian faith were NOT defended in a circular fashion, then it would either be (1) unjustified, in which case we have no reason to believe it (by definition) or (2) it would be justified by something greater. But there is no one greater than God, and no standard for knowledge greater than His Word. Hence, God’s Word must justify itself. Peter: He makes that mistake because he confuses reasoning with knowledge and with revelation. Dr. Lisle: Actually, I suspect you may be confusing truth with knowledge. Let’s examine each in turn. Peter: Reasoning is a process that goes on in our head. Dr. Lisle: Well, I would say that reasoning is one of the functions of the mind. But that’s not a definition. Reasoning is a mental process by which we discover and justify truth. Peter: Knowledge is the content. Dr. Lisle: This is insufficient as a definition. The mind contains many ideas, but not all of them are knowledge. A person’s mind may hold false beliefs – these are not knowledge. God confirms that the “wise” reasoning of unbelievers is empty/useless (1 Corinthians 3:20). It is not knowledge at all. Furthermore, a person may believe some things that are true, but are unjustified – meaning the person doesn’t actually know that they are true. Knowledge is true, justified belief. Peter: Revelation is how God makes sure we have true knowledge. Dr. Lisle: Revelation is the giving of some of God’s thoughts to man. The question is how do you know that these thoughts are from God? How do you justify them? So the question I am going to ask you is, “How do you know that the Bible is revelation from God?” Can you answer this without any degree of circularity? Bahnsen says you can’t. For any answer you give will implicitly assume the truth of the Bible. Peter: Our reasoning is always faulty, so God needs to enlighten our hearts to come to trust in him. Dr. Lisle: Is your reasoning here faulty? If so, then we may reject it. Peter: That is the essence of presuppositionalism. Dr. Lisle: No. The essence of presuppositionalism is that you must reason within the Christian circle or you cannot actually know anything. All beliefs would be ultimately unjustified apart from the truth of the Christian worldview because knowledge begins with God (Proverbs 1:7). Peter: God transcends everything, including our own, circular reasoning—which is a fallacy. Dr. Lisle: God’s reasoning is necessarily circular because He already knows any conclusion that He draws. So if God’s thinking is circular, how can that be a fallacy? Peter: A big thumbs down on this article; it is a subtle attack on Christianity. Have a look at Bahnsen’s book “Van Tils Apologetic” for a detailed explanation of the presuppositional method. Dr. Lisle: Hi Peter. Thanks again for posting. Peter: You misunderstood what you quoted. When Bahnsen writes “We hold it to be true that circular reasoning is the only reasoning that is possible to FINITE MAN,” Bahnsen is condemning FINITE MAN. Dr. Lisle: No, Bahnsen is not condemning finite man, because man is finite by God’s design. We do not condemn that which God has decreed. Adam was created finite AND perfect before he fell into sin. Therefore Adam, in his perfect state would have had to reason in a circular fashion because “We hold it to be true that circular reasoning is the only reasoning that is possible to finite man.” (Bahnsen, Van Til’s Apologetic, p. 518). This cannot be sinful because Adam had not yet fallen. It is not wrong to be finite, nor to reason in the only way possible for finite men. Furthermore, after just explaining the presuppositional method, Bahnsen affirms that the method he endorses is circular reasoning (yet not viciously so). He states, “The method of implication as outlined above is circular reasoning. Or we may call it spiral reasoning. We must go round and round a thing to see more of its dimensions and to know more about it, in general, unless we are larger than that which we are investigating. Unless we are larger than God we cannot reason about him any other way, than by a transcendental or circular argument.” (Bahnsen, Van Til’s Apologetic, p. 518). Bahnsen is obviously not condemning the very apologetic method he endorses. Nor is he ashamed of it. Bahnsen states, “The charge is made that we engage in circular reasoning. Now if it be called circular reasoning when we hold it necessary to presuppose the existence of God, we are not ashamed of it because we are firmly convinced that all forms of reasoning that leave God out of account will end in ruin” (p. 519). Clearly, he is not condemning the circular reasoning of the presuppositional method. Peter: Bahnsen is stating that human systems, in contrast to the divinely transcendent, are circular reasoning. He is condemning the limitations of FINITE MAN. Dr. Lisle: No, he is not, and there are two problems here. First, Bahnsen is explaining that circular reasoning is rationally necessary for finite man, and yet the Christian circle makes knowledge possible whereas all other circles self-destruct. He is not condemning man for reasoning in the only way we can! He states, “Unless we are larger than God we cannot reason about him any other way, than by a transcendental or circular argument.” (p. 518). It is by God’s perfect design that man is finite. It is not a sin to be finite, nor to reason in the only way possible within the limitations that God imposed on us. So it would be irrational to condemn what is by God’s design. If we condemn the only type of reasoning possible for finite man, then we condemn God for making us finite. Second, all of God’s reasoning is necessarily circular. Think about it. How does God know anything? Because He is God. How does God know that He is God? Because He is God. Any conclusion that God draws is something that He already knows and affirms. Bahnsen affirms that God reasons in a circular fashion. He states, “Our reasoning frankly depends upon the revelation of God, whose ‘reasoning’ is within the internal-eternal circularity of the three persons of the Trinity” (p. 520). Bahnsen then goes on to explain that it is not fallacious in the way a vicious circle is because it spirals out of its own plane, just as I pointed out in my article. The type of circular reasoning employed in a transcendental argument is NOT fallacious. Peter (quoting Bahnsen): “The ‘circularity’ of a transcendental argument is NOT AT ALL the same as the fallacious ‘circularity’ of *an argument in which the conclusion is a restatement of one of its premises*” (n122, p 518). Dr. Lisle: Correct. Note that Bahnsen again confirms that the transcendental argument is circular. Here he is distinguishing between the virtuous circularity of the transcendental argument which is rationally necessary, and the vicious circularity of those arguments that arbitrarily assume what they attempt to prove. But he is obviously not denying the circularity of the transcendental argument since he has specifically stated that it IS circular reasoning. Is that clear now? Peter: “An argument in which the conclusion is a restatement of one of its premises”—is the DEFINITION of circular reasoning. Dr. Lisle: That is not the definition of circular reasoning in the way that Bahnsen and Van Til used the term. Rather, that is essentially the definition of begging the question – the petitio principii fallacy – an argument that arbitrarily presupposes as a premise its own conclusion. [See Introduction to Logic (Copi & Cohen, 10th edition, p. 186).] Circular reasoning, in the way that Bahnsen used the term, is a chain of reasoning (usually involving multiple arguments) in which the conclusion of one is a premise of one of the arguments upon which it is based, or where each part of a system of thought assumes all the other parts. Circular reasoning can be done in a vicious way, or a virtuous way. If it is vicious, then it is also a petitio principii. On the other hand, if the premise is rationally necessary, then it is not arbitrary and is not a petitio principii. For example, arguing that laws of logic must exist because the alternative makes knowledge impossible is a virtuous argument, but it is circular because it presupposes logic which is also its conclusion. Peter: Also by definition, circular reasoning is a fallacy. Dr. Lisle: No, not in the way Bahnsen and I use the term. Only vicious circular reasoning is fallacious. Virtuous circular arguments are both valid and sound, and are not arbitrary. Therefore, they cannot be fallacious. They violate no laws of logic. Again, ironically, you are reasoning in a vicious circle. Namely, you want to persuade me that all types of circular reasoning are fallacious; and to “prove” this you simply define all circular reasoning as fallacious. This begs the question. Can you prove that all types of circular reasoning are fallacious without first assuming it, and thereby begging the question? If so, then I am going to ask you how you can prove that laws of logic exist. Peter: The transcendental argument is “NOT AT ALL” that. Dr. Lisle: It’s not a fallacy. But it is circular as Bahnsen affirms when he states, “The method of implication as outlined above is circular reasoning” [p. 518, emphasis added]. Peter: We finite men misinterpret God’s revelation as “circular;” there is no virtue in that. Dr. Lisle: No. I think you may have misunderstood. Revelation is not circular. And no one is claiming that. However, the way we demonstrate that the Bible really is revelation from God must entail a degree of circularity. We must presuppose this revelation in order to justify the preconditions of intelligibility by which we prove anything whatsoever, including the proposition that the Bible is revelation from God. The circularity is inescapable, and hence virtuous. Peter: At the end of the note, Bahnsen adds— “Because there is more than one kind of ‘circularity,’ Van Til sometimes repudiated and sometimes tolerated the notion that his apologetics was circular—which has undoubtedly been confusing to his students” (p 518). Dr. Lisle: Note that Bahnsen here is affirming what I wrote in my article – that not all circularity is fallacious. There are virtuous circles, and vicious circles. Van Til and Bahnsen repudiate vicious circular reasoning, and tolerate – even endorse – virtuous circular reasoning: namely, the transcendental argument. Peter: Van Till REPUDIATED but also could TOLERATE misunderstandings by finite man. Van Til repudiated finite man because he misread God’s revelation as “circular reasoning.” But Van Til lauds God’s revelation, because it is larger than man, it TRANSCENDS man, it comes from OUTSIDE the vicious circle of his presupposed autonomy. Dr. Lisle: No. You seem to be confusing reasoning with revelation. Revelation is the imparting of God’s thoughts to man. It is not circular. The way we know (rationally justify) that such revelation really is from God is necessarily circular, for we must accept God’s revelation as such in order to justify our ability to discern God’s revelation from anything else. This is circular, yet it is rationally necessary and therefore virtuous. Peter: Elsewhere, Van Til distinguishes between “circular reasoning” and the fact that the Christian has made everything to “turn on God” (p 143). One is a fallacy, the other conviction. Dr. Lisle: Vicious circular reasoning is fallacious because it is arbitrary; virtuous circular reasoning is not fallacious because it is rationally necessary. Van Til knew this and wrote about it. Bahnsen clarified the situation even more explicitly. Dr. Lisle: Can you please demonstrate this without begging the question? If you can, then can you please prove that laws of logic exist (without using them)? Peter: it may reflect a hostile attitude; it is something that critics, sinners, and non-Christians do. Dr. Lisle: Actually, sinners reject the virtuous circular reasoning used to demonstrate the truth of the Christian worldview. Circular reasoning is rationally necessary for finite man, and therefore not sinful if used in a virtuous way. As Bahnsen so eloquently put it, “We hold it to be true that circular reasoning is the only reasoning that is possible to finite man” and “we prefer to reason in a circle to not reasoning at all.” (p. 518). 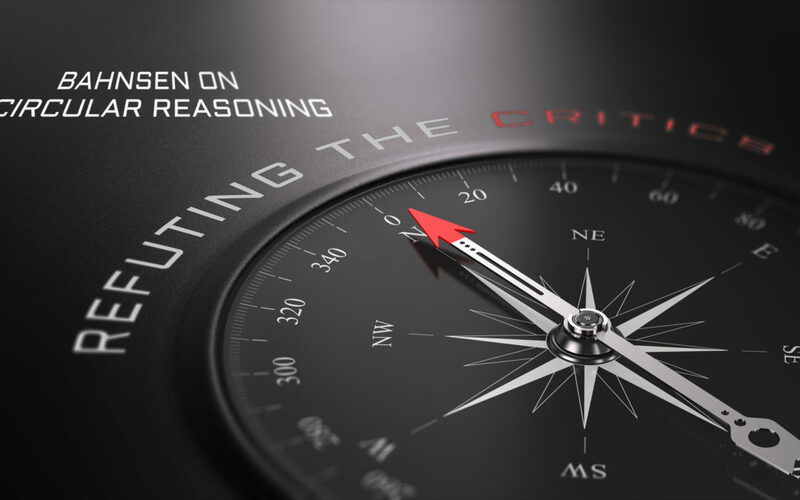 Since the only alternative to circular reasoning is to not reason at all, if you condemn circular reasoning, then you are necessarily suggesting that we shouldn’t reason at all. Yet, God commands us to reason (Isaiah 1:18, Psalm 32:9). And again, all of God’s reasoning is ultimately circular since He already knows any conclusion that He draws. We dare not condemn the way God reasons. Dr. Lisle: God made man finite. Circular reasoning is the only option for finite man when it comes to an ultimate standard. Therefore, it is by God’s design that man should use circular reasoning. To condemn virtuous circular reasoning is to condemn God for making man finite. Peter: “CRITICS who have faulted Van Til for committing the fallacy of CIRCULAR REASONING have failed to understand his position correctly. Van Til is simply making the point that the Christian worldview is a *coherent and unique system* in which every part assumes every other part” (Greg Bahnsen, *Van Til’s Apologetic*; n116, p 214). Dr. Lisle: Bahnsen is correct. It is the sinner who wants to evade the Christian circle. Peter (quoting Bahnsen): “So then, to overcome this HOSTILE ATTITUDE of the sinner, it is necessary that the Holy Spirit convict him of his sin in not accepting the Bible as the Word of God” (p 218). Dr. Lisle: Bahnsen is again correct. The sinner needs to repent for claiming that we cannot accept the Bible as self-attesting – as proving itself in a virtuous circular fashion. The sinner’s rejection of virtuous circular reasoning is both irrational and immoral. These quotes pretty much sum up my article. The Bible proves itself (that is circular, but virtuous). Sinners want to avoid all circular reasoning, but as finite beings they cannot. By rejecting the Christian circle, they end up in a self-destructive circle that would make knowledge impossible. The only alternative to absurdity is to embrace the Christian circle which not only proves itself (which is circular by definition) but “spirals out” and makes all knowledge possible. Peter (quoting Bahnsen): “Nevertheless, if we hold consistently to our Christian commitments, we find objectivity in God’s point of view—in divine revelation, not in human reason. The NON-CHRISTIAN will not accept God’s revelation as the ultimate standard of truth, and he will therefore accuse the believer of “subjective prejudice” for evaluating all things according to that presupposition. Inevitably, arguments over subjectivity become “CIRCULAR,” for that way in which one views it stems from one’s controlling presuppositions. There are really no two ways about it, nor is there any middle ground. The TWO WORLDVIEWS operate with different notions of objectivity” (pp 284-285). Dr. Lisle: It’s a good quote and consistent with my article. Both the Christian and non-Christian worldview are ultimately circular. The Christian circle makes knowledge possible. The non-Christian circle “self-destructs” and would make knowledge impossible. Peter (quoting Bahnsen): “We hold it to be true that CIRCULAR REASONING is the only reasoning that is possible to FINITE MAN” (p 518). Peter (quoting Bahnsen): “The method of implication is circular reasoning. Or we may call it SPIRAL REASONING” (see note 122; p 518). Dr. Lisle: Here Bahnsen is referring to the transcendental argument. He affirms that it is indeed circular reasoning, which is what I’ve been saying all along. Do you now agree? Notice that this is a virtuous circle in that it spirals out of its own plane, proving itself and everything else that is provable. This is how I expressed it in the article. The illustration at the top of my article contrasts the simple vicious circle on the left with the underlying virtuous circle or “spiral” that circles beyond its starting point, and proves everything else. Dr. Lisle: No, Bahnsen has already clearly affirmed that the transcendental method “is circular reasoning.” (p. 518). Here he contrasts the virtuous circle of the transcendental argument with vicious circular reasoning, the latter of which begs the question – the petitio principii. This is again what my article is all about. Dr. Lisle: Here, Bahnsen again affirms the circularity of the transcendental method as I did in the article. It is virtuous circular reasoning (“all parts are consistent with or assume each other” – that’s circular reasoning by definition) and “which is required when one reasons about a precondition for reasoning” – it’s rationally necessary and thus non-arbitrary. Bahnsen then contrasts this virtuous circular reasoning with the vicious circularity of non-Christian thought. He even uses the same word I did (“vicious”) to describe the fallacious variety of circular reasoning. Dr. Lisle: Students new to logic often assume that all circular reasoning is fallacious, without understanding the difference between virtuous circles and vicious ones. Hence, they are confused by Van Til’s affirmation of virtuous circles, and his repudiation of vicious ones since they fail to recognize the difference. My article was meant to clarify this issue. Peter: (i.e., apparent “circularity” is not at all the same as circular reasoning; n122, p 518). I suspect that you have been using the term “circular reasoning” to mean “vicious circular reasoning.” But Bahnsen, Van Til, and I simply use this term to refer to a system of thought or sequence of arguments which presuppose (either necessarily or arbitrary) some or all of their conclusions. If they presuppose their conclusions consistently and necessarily, then the circularity is virtuous (e.g. using logic to prove logic). If they presuppose their conclusions arbitrarily, then they are vicious (e.g. assuming naturalism as the basis for naturalism).